Source: Free For a Limited Time on Amanda's Website! Don’t miss this imaginative new short story set in the magical world of Watersong—a realm of enchanting beauty…and terrifying secrets. Aggie is a mythological creature on a secret mission. Lydia is a young woman from a magical family with no real powers of her own. And Daniel is a high school boy who’s made it his duty to protect his deeply troubled older brother. Then one fateful night, their lives collide in a terrifying accident that changes them all forever. And beneath the surface, the ripple effects of the accident will have more impact than anyone could ever guess...changing not only their future, but the fate of an entire town. 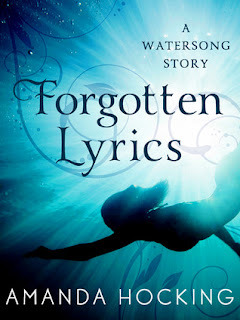 Forgotten Lyrics is the perfect novella to introduce readers to the world of Amanda Hocking's Watersong Series! Even readers who have already gotten a taste from the first book in the series, Wake, will benefit from the back story that Forgotten Lyrics provides in suspenseful and dangerous tones. Forgotten Lyrics takes us back five years, highlighting a fateful event briefly mentioned in Wake. The emphasis on the accident that left Daniel with scars on his body, and a deep understanding for the duty to take care of one's sibling, does more than strengthen his character. It introduces us to another piece of history mentioned in Wake, that of the sirens Penn, Thea, and Lexi. I think this story will either increase or decrease the readers dislike of the mysterious sirens. Aggie seemed to be on the verge of giving the sirens a good name, but her moments of graciousness are greatly overshadowed by her sisters' vile attitudes. I'm glad Hocking decided to give readers a greater look into the sirens' past, because knowing what truly happened to their fourth member is a grave eye-opener. What I really love about Forgotten Lyrics is that it opens up the world to the certainty of a more substantial supernatural community. Lydia's grandmother Dalia has special senses that put her in the know with any supernatural creatures that may come her way for help. She becomes a temporary bridge between Daniel and the sirens that will beg the question: what is so special about Daniel? It's a question that will haunt the back of readers' mind, even into the next book of the Watersong Series, Lullaby! Check out my reviews for WAKE (available now) and LULLABY (coming November 27th)! !